Boat-trips to watch pelagic sea-birds and other marine wildlife. Summer & autumn 2019 are available. Tours from June to October - NEW Dates for 2019 coming soon. For now - dates are on request ! 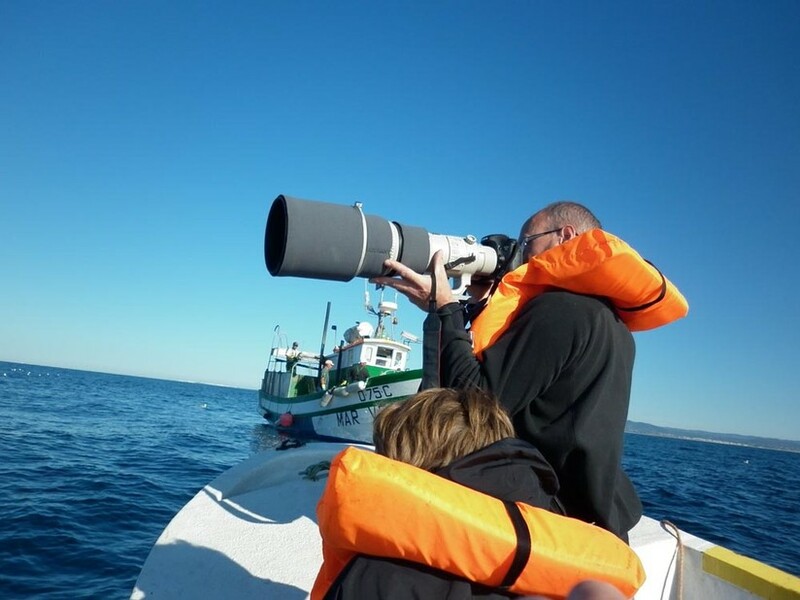 Birdwatching-Algarve offers Pelagic Boat-Tours going out from Fuzeta (a fishing village between Olhão and Tavira) in cooperation with the Boat-Tour operator Passeios Ria Formosa. Great Shearwater (Puffinus gravis) in the Algarve, Oct. 1st, 2014 (GS). 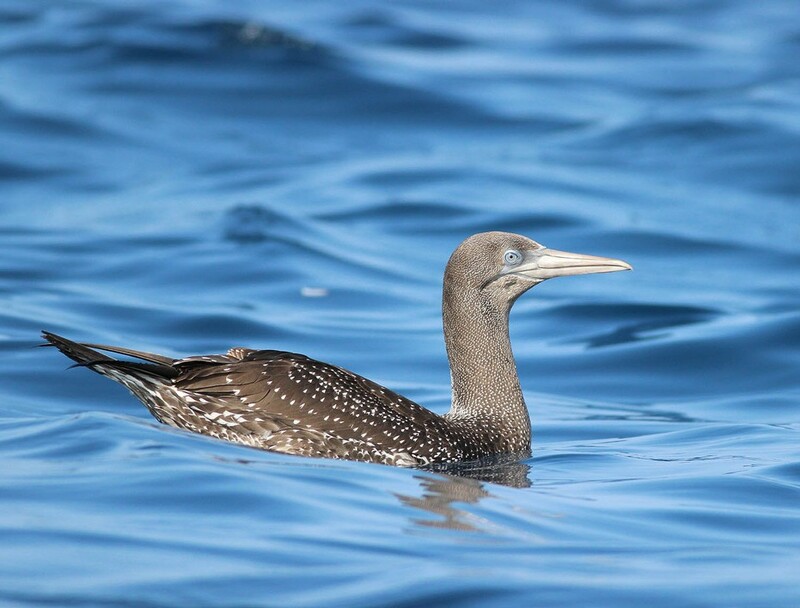 During the c. 2,5 hours Tour we will be headed out for about 5 to 6 miles off shore, until we reach the best areas for the observations of seabirds. (During a "chumming-session", we will then attract several species of sea-birds close to the boat. )* This event gives usually excellent opportunities for photographing or filming. Boat: A glass-fiber boat with a cabin and comfortable seats or a modern rib for up to 12 people. Price: 40 € per Person (4-12 people). Here is a map to the meeting-point in Fuzeta. To check for availability and to make your reservation, please send me an e-mail. A juvenile Northern Gannet (Morus bassanus) close up next to the boat. October 2014 (GS). Northern Gannets (Morus bassanus) occasionally dive down like a harpoon right next to the boat, to catch a piece of fish before it sinks down. Various Gull-species might perform a fight about the best pieces, soon chased by one or more Skuas, which take away the food from other seabirds (a behaviour called “cleptoparasitism”). Terns show up, too and also Shearwaters might have a look on the scenery. The last birds showing up are normally the Storm Petrels, which pass by often closely and fly around the boat, trying to catch floating particles of the food offered from the surface in their unique manner. (Tursiops truncatus) are the most abundant sea mammals. Harbour Porpoise (Phocoena phocoena) also occurs. 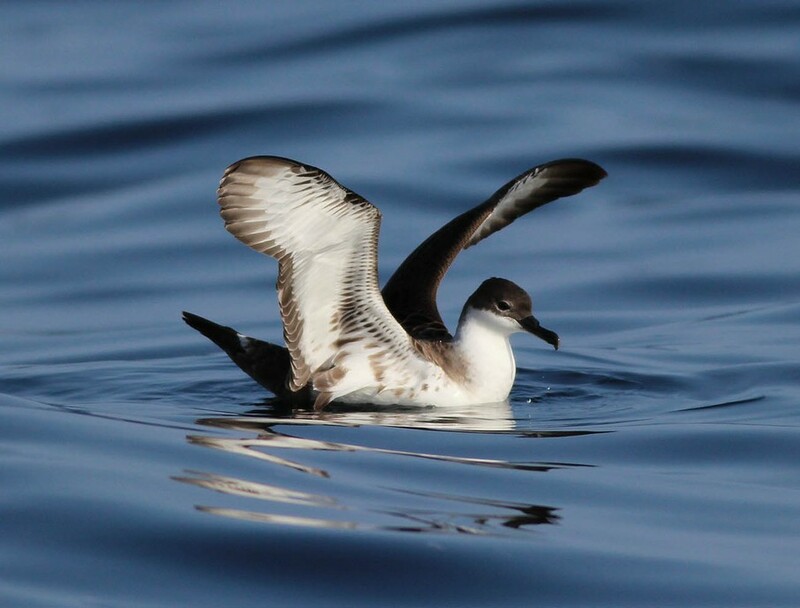 During the trip, we come across sea birds on passage and will get good views of Shearwaters - Balearic Shearwater (Puffinus mauretanicus) and Cory's Shearwater (Calonectris borealis ) are, depending on the time of the year, the most frequently seen among them. In- and out from Fuzeta, we will cross the lagoon system of the Ria Formosa Natural Park and will have the opportunity to observe various Waders, Gulls, Terns, Egrets and Spoonbills. Main season for pelagics here is late May to November, with August and September being perhaps the strongest month (depending on species). Please contact Birdwatching-Algarve for the booking and for further information.